Last Saturday, January 25th, I took a ride into Philly and headed over to GreensGrow Farms, in Kennsington. I'm going to teach a knife skills and knife sharpening class there on February 8th. 12 to 2 pm, $20, bring a dull knife and go home noticeably sharper! I needed to do a dry run to check out the space. In the 16-17 years that GreensGrow has been a working urban farm, I've never been to it. I've wanted to go. I certainly know a lot about their mission all the wonderful things that they do for the surrounding community. I love that they have taken what was once an urban, industrial "waste-land" and reclaimed the grounds, turning something undesirable into a viable food oasis in a food desert region. I've long been a fan of the fine work that the founders, Mary Seton Corboy and Tom Kereduk did and still do. Seeing the farm in winter didn't diminish its specialness. A fresh coat of snow all over the neighborhood and winter tunnels brought a sparkle of life the the farm. I visited on a "Winter CSA Day", the main green house store was bustling with people, busily picking out their winter crop shares. A few vendors are on hand, pouring locally roasted coffees (ReAnimator Coffee Roasters); Girl Scouts were hawking thin mints and doe-see-doe's; local farms had fresh eggs, winter apples for sale and bags of heirloom cracked grits was on special offer to CSA members. I felt like Laura Ingalls Wilder dropped into the General Store after a hard winter on the plains and subsisting on hard-tack biscuits. A bit over-whelming with all that was available while being lovely and amazing. I'm looking forward to my class with GreensGrow Farms. It's been a wish of mine for a long while to branch out with my cooking classes. Expanding the "brand" of The Bicycle-Chef and Collingswood Food Swappers. I'm keen on having the knife skills class become one of many new ventures with Greensgrow. Monday night, January 27th brought me to the Free Library of Philadelphia, for the Philly Swappers winter swap. Seems so long ago that I first attended one of their events, but it was only last April, a mere 7 months ago! And look at where the past 7 months has taken me! My own food swap group, with four swaps to our credit; friends with many other swappers and groups; co-sponsor of swaps; attendee and mentor to other swappers just starting out. How nice to be a part of an underground network of food happenings. The Philly Swappers winter event was well-attended. It seemed as though there were about 40 people participating. Unlike the April event, this one was so calm and quiet. There wasn't the hyper-kinetic frenzy I witnessed. Sampling and checking out one another's wares was very civilized - so much so that I had that awkward girl at the school dance feeling again - not sure if anyone would approach me to ask me for a dance…I needn't worry. While the onlookers were subdued in their approach, my swap card quickly became full of potential "buyers" of my wares…Trading time picked up speed but never became a too much of a whirlwind of activity. More than anything there was a steady and deliberateness that I rather enjoyed. We all knew why were were here and what we wanted! There was a wide variety of items: several high-end ice creams; wildly decadent flavored pop corns - I lucked out with a trade for Habanero Caramel Corn! So sweet and fiery! Jars of easy chills; packets of instant oatmeal with exotic mix-ins; artisan breads; organic pies and pie fillings; granola; jams; home-made chocolate hazelnut spread; and my favorite (but not in the luck of my draw this time) a vegan treat called "Millionaire's Bacon", which was coconut chips with a sweet, smokey meaty flavoring. A taste so good that I can see that it should make the chef a millionaire with the recipe. I came home with all of my jars of Balsamic Fig Jam and Apple Cranberry Compote snapped up. In exchange I have two different cranberry chutney's; another fig jam; granola; pumpkin oatmeal cookies - devoured in two days; the oatmeal packets; quick bread; Meyer lemon marmalade; and a wonderful jar of apple pie filing. There are other goodies here too. The larder is quite full of jars of put up goods. As my swaps grow, the ideas do too. Collingswood Food Swappers next event is scheduled for Saturday, March 8th, early evening. 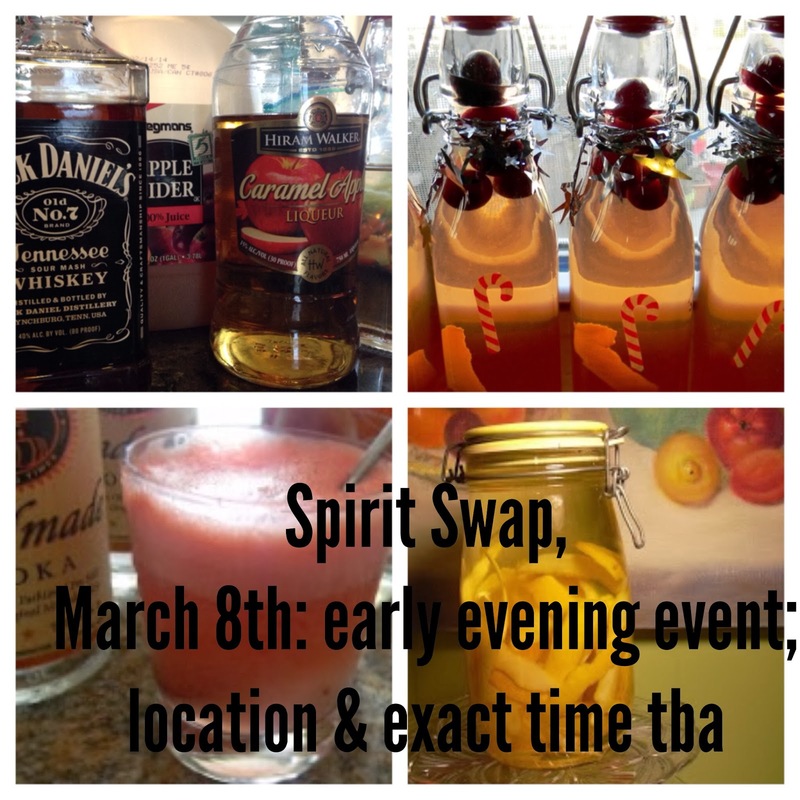 We'll be doing a "Spirits Swap" which will be infused liqueurs; home brews; cordials, bitters, tonics, etc. Along with a smattering of cocktail nibbles and treats. Swaps may be all the rage and I intend to keep the interest piqued and lively. Gad you enjoyed the cookies!